Mukesh Ambani has large palms with fingers on the shorter side. The first and second phalanges of his fingers are all long, significantly so. This by itself makes his hand stand out. 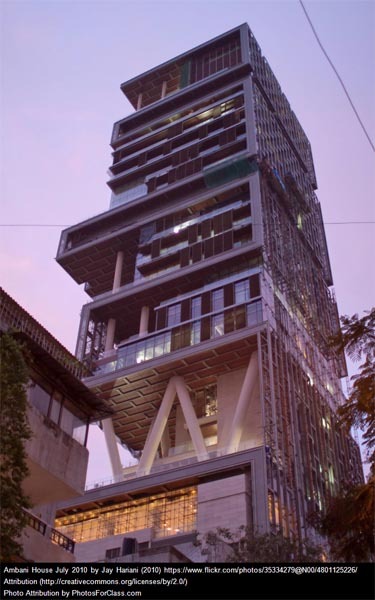 There is no doubt that Mukesh Ambani’s intellectualism, energy, and business acumen is significantly above average. these personality traits are inherited. The early environment was clearly conducive because these qualities are seen as developed on his right hand (which shows his current personality). The thumb is of a good length, although supple, and the top phalange is long. 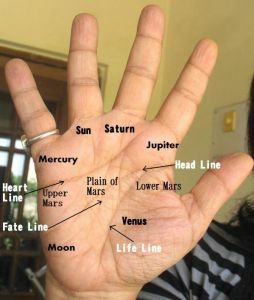 The lines of his hand are fairly clear too, with the heartline long and reaching the Jupiter mount and the headline appears to be forked. The lifeline stops halfway but restarts somewhere near the headline, although the latter cannot be verified because of a lack of good photos of the hand. There aren’t too many good photographs of Mukesh Ambani’s hands on the internet. But you can check out these two, here and here. The photo of his house published below is a free photograph. The shape of Mukesh Ambani's hand shows a personality which is reliable, dependable and pragmatic. He is a driven individual and a large picture person. Material success is important and there is an innate understanding of business and how the material world works. Versatility is shown but he is the kind who trusts what he sees and feels. This can at times restrict his imagination and abstract ability. Goal-oriented and driven he may be, but Mukesh likes to feel passionate and inspired by what he does. He does not like routine and can get bored without a stimulating environment. He is an objective and an independent thinker but he is also restless and has intense feelings. However down to earth Ambani may be, his attitude towards romantic love is idealistic. He expects his loved ones to be a certain way, and it is important to him how others perceive them. This can lead to feelings of disappointment as he could expect too much. Besides, he is not particularly demonstrative and can appear distant to his loved ones. Mukesh Ambani's hand shows tremendous willpower, of the kind which can achieve almost impossible tasks. He has a strong will which can alter his life if he wishes it to and it is rare for such people not to fulfil their potential. The downside is that people like Ambani will have high expectations from others. He is the type to leave no stone unturned if it means fulfilling an ambition. He is not the kind to leave things to chance. He should be careful in decision making though because such a strong will means single-minded aggression and pushiness to get things done, but at times it can override reason. This is more applicable to Mukesh Ambani as impulsivity is also present in his personality. You might also like to read about the personalities of Anil Ambani, Ratan Tata's hand analysis or Laxmi Mittal's Hand Reading or Vijay Mallya's hand analysis or The Hand Analysis of Bill Gates or check out the personality characteristics of Businesspeople from around the world.